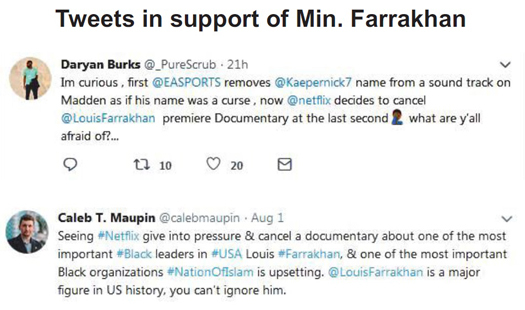 The recent decision by Netflix to cancel a documentary about the Honorable Minister Louis Farrakhan of the Nation of Islam isn’t really about the movie not being seen. It is about a relentless campaign to smear, isolate and destroy a man who has devoted his life to Black people and the cause of freedom, justice and equality. Destroy? Isn’t that a rather strong word? Not really. The FBI’s domestic war pitted Black groups across the political spectrum, from Dr. Martin Luther King, Jr., and civil rights groups to the revolutionary Black Panther Party, against one another. FBI operatives also infiltrated these groups and pit members against one another. Then there were assassinations, like the 1969 killing of Black Panther leader Fred Hampton in Chicago. The FBI operation knew virtually no bounds and in its efforts to destroy the Nation of Islam and other groups. So, if the government worked to destroy a movement yesterday and a man resurrected that movement today, is it possible that the man would be left alone? Emphatically not! When he brought back the Nation, beginning his work in the late 1970s, Min. Farrakhan was clearly a threat. His uncompromising voice and his independent support base only added to the desire to destroy him. When he called nearly two million Black men to Washington, D.C. in 1995, despite ridicule and no help from major corporations, civil rights groups, unions, political organizations or sponsors, the Minister’s threat level rose even higher. The Minister was sanctioned by the Senate in 1984, with no Blacks in the upper chamber of Congress, and a federal lawmaker from Indiana is seeking House sanction of a man who is not a government official and who has never even been arrested. While the media assaults have been constant, an onslaught has come full force since February 2018. Alongside the “condemn Farrakhan” chorus of the enemy is the effort to punish, kowtow, bludgeon and smite anyone who comes near Min. Farrakhan. We saw that with the pitiful yelps of Rep. Keith Ellison (D-Minn.) declaring he wasn’t with Farrakhan and the pressure exerted on activist and Women’s March co-chair Tamika Mallory by those who hate a man Black America and others love. Scripture shows us Pharaoh worried about the growth of the children of Israel and wisely tried to destroy them. Pharaoh feared the children of Israel would join onto an enemy and come against those who had oppressed them. Biblical rulers also sought to find and kill deliverers, just look at the stories of Moses and Jesus. Is this a prophecy that points to today or a work of fiction and relic from yesterday? The divine word, if understood, shows us what is happening today using signs and symbols of yesterday. Blacks in America fulfill the prophetic picture of the children of Israel and the Honorable Elijah Muhammad, patriarch of the Nation of Islam, is the modern Moses, and Min. 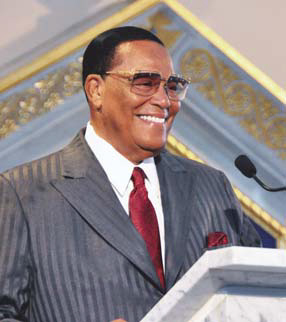 Farrakhan is the modern Aaron. And, there has always been a fear that Blacks might join on to a foreign enemy or become a domestic threat inside the United States of America. That’s one of the reasons for the super-surveillance and over-policing of Black people and targeting of Black organizations. Also pushing the federal government are the wicked members of the Jewish community, who have opposed every good deed and all of the good works of a good man. According to the New York Times, Jewish groups pressured Netflix to drop the documentary. “This film will not be released on Netflix. Due to an internal miscommunication, it appeared to be scheduled for release on Netflix, but it is not. We apologize for any confusion this has caused,” a Netflix spokesperson said Aug. 1. But the Minister’s documentary was to appear on the global streaming platform with promos of the movie cited in overseas listings. The Nation of Islam, in a statement, said: “The Honorable Minister Louis Farrakhan produced a documentary entitled, ‘My Life’s Journey Through Music’. “As late as July 30, 2018, Netflix published that this documentary would be ‘Coming August 1’ on its media platform. On July 31, 2018, less than 24 hours before the airing of the documentary, the Nation of Islam became aware through news and online outlets that Netflix decided not to air it due to ‘internal miscommunication’. “In light of this untimely sequence of events, did Netflix bow to outside forces in canceling the airing of the documentary? Consider that. Why this one man, why the unceasing opposition, why the rabid reactions? Are you truly ready to pay the price for freedom?